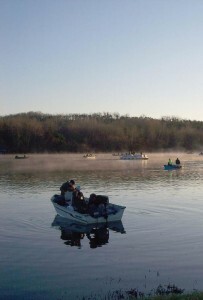 County in participating in a partnership that could be formed to preserve the lake fisheries. The property is located in a rural area of Beaver County, away from the County’s population Centers. And although Hereford Manor Lakes benefits all residents of the western Pennsylvania region. The immediate service area population concentration is primarily located within the Harmony, Zelienople, and Cranberry Township areas of Butler County. However, Butler County is also being asked to partner with the Commission to resolve similar problems associated with the Commission’s Glade Run Facility. Furthermore, Hereford Manor is located near Brush Creek Park, a Beaver county owned and operated park facility of similar size and offerings. Brush Creek Park’s only limitation is that it does not provide quality lake fishing opportunities of Hereford Manor Lake. Franklin Township, where Hereford Manor Lake is located, is also concerned about the future of the lakes and they too desire to retain a lake fishery on the property. But, given Franklin Township’s small population and limited resources, they are not in a position to contribute resources towards making the improvements required to bring the dams into compliance with state regulations. Regardless of county and / or municipal participation, our analysis indicates a substantial demand for Angling opportunities in the Hereford Manor region. According to 2006 Fishing Licenses sales, there Are over 122,000 licensed anglers within the local service area, a thirty mile radius of the facility, and Over 195,000 licensed anglers (not including Ohio residents holding out-of-state licenses) within the Regional service area, a sixty mile radius. Licensed anglers in the regional service area represent over 25% of total fishing licenses sold in Pennsylvania. Further, these numbers do not include youth, under The age of sixteen as they are not required to hold a license. When compared to the supply of lake Fishing opportunities similar to Hereford Manor, Hereford Manor’s lakes represents 16%, 65 acres, of The 336 acres of similar lake fishing opportunities located in the local service area. Losing Hereford Manor as a lake fishery is bound to have a significant negative impact on the amount of money being spent in the region by anglers pursuing their sport in western Pennsylvania. 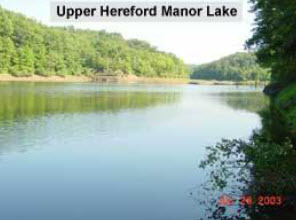 The Hereford Manor Lakes property was purchased by the Pennsylvania Fish and Boat Commission in 1972 from Mr. J.M. Cunningham. 1972 indicates the lower dam was constructed in 1949. We suspect the upper dam was also created around this time. The lakes were developed by placing dams across Doe Run. Local residents have indicated that Mr. Cunningham operated the property as a pay lake until it was acquired by the Pennsylvania Fish and Boat Commission. Aerial photos of the property obtained from www.pennpilot.psu.edu provide us with images of the property over the past sixty-eight years. The first available aerial photograph of the property is from April 29, 1939. 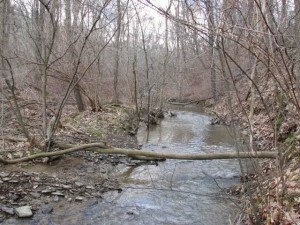 In this photograph you can see Doe Run traversing the property before being dammed and before the creation of the lakes.